Identity management has become an increasingly essential part of the governments’ business. 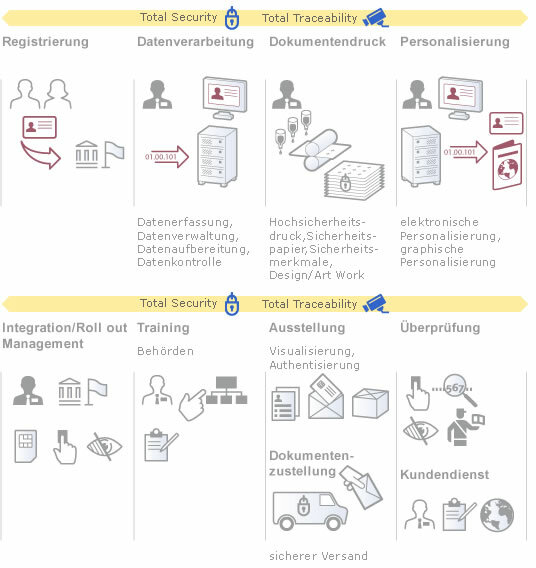 The challenge of national security, immigration control, efficient boarding and disembarkation procedures and all kinds of state administration from entitlements via tax declarations to vehicle registration certificates all call for secure, robust, convenient and cost-effective identity management solutions. OeSD is responding to these challenges with services & solutions which match the latest public sector requirements. For biometric identity or national identity documents (ePassport, eID cards) using an elaborate security concept, OeSD’s eGovernment unit is your partner of choice. OeSD can support you with advisory services at all stages of a complex national identity management system. OeSD could be your Identity Management Integrator, supporting governments at every stage: from the initial idea via personalization through to product delivery and integration. Regardless of the number of issued eID documents, our customers can rely on our deep understanding of public sector processes and our ability to develop customized solutions for any national or regional noteworthiness. Furthermore you can count on our individual, unbureaucratic and flexible support service.